I have had the pleasure of staying here often and have also written reviews previously on this hotel but Iâ€™m doing so again because it is just such a great place. 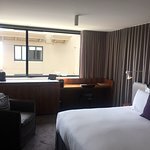 I recently had a 3 night stay in Sydney at the Larmont and as usual it was a very pleasant experience. The rooms are so clean, the bed extremely comfortable and the staff are so friendly. The Larmont would definitely be one of the very best hotels in Sydney and I can not recommend it highly enough. Special mention to the wonderful staff and in particular the Executive Assistant Manager, Kenza who went above and beyond to ensure my stay was perfect. In addition to being such a wonderful hotel, the location is perfect with major supermarkets, restaurants and Kings Cross Railway Station just on the door step. If you are planning a stay in Sydney then you simply must stay here. Exceptional! Very well appointed contemporary and comfortable rooms. The hotel foyer is also beautiful. Staff consistently donâ€™t miss a beat. You will not find another hotel in Sydney as good as Larmont Potts Point for this price. Thanks so much for taking the time to let us know how we did, it's always a pleasure having you in house with us! We are so delighted that you enjoy the comfortable rooms, foyer and of course our amazing team we have here. I can't wait to welcome you back to Larmont Sydney soon. Thanks for reviewing your recent visit to Larmont Sydney! We are all so happy that you loved your stay here especially the staff who were able to make your stay extra special with wine and chocolate to kick off your anniversary celebrations! I will be sure to let Portia know your amazing comments. Thanks for choosing to stay at Larmont Sydney for your special occasion and we can't wait to welcome you back soon. My new fave 'go to '. I felt welomed and valued from the minute I walked in. Everyone was so smiley and friendly. I had been upgraded to a room on a high floor, but as I really wanted a bathtub, happily swapped for, a terrace room... open door, sit, outdoor , clean and smelled good. ( some plants would have been pretty ). The bed was beautifully comfortable. The stack of pillows as tall as I. Every sort of modern dock imaginable. divine understanding from the staff that I am not of an age that eats from boxes with plastic cutlery. Somehow plates appeared and cutlery, and even a cloth napkin. So very much appreciated. A nespresso coffee machine, tea and a mini bar, the soft drinks from which, as were the chips/chocs etc, no charge. The Larmont is a spit from kings X staion which makes it easy ro get,,, anywhere. The X is still wonderfully seedy, and yet has some of the most fabulous stores in Sydney. I do though think the thing which stand Larmont aside from any other Hotel in Sydney are the Staff. I have in the past always stayed at some well know 5 star chains. Thank you for having me, I most certainly will be back. I stayed there in a beautiful room with a great view to the Harbour Bridge and the Opera House. The room and the facilities were really tidy and comfortable and some of the services included yoga classes and a gym. The girls at the reception were amazing and helped me with everything I needed. Special thanks to Maria in reception who went above and beyond with her service. Thank you so much for the wonderful review! The views really are spectacular aren't they? The Sydney Harbour certainly is stunning. I will be sure to pass along your outstanding feedback to Maria - she is an important asset to our team for sure. Please come back and see us again soon!